I remember the not too distant days of visiting a pretty place with a film camera in hand and trying to make a nice photograph. I loved shooting 35mm Velvia slide film… the colors were rich and saturated, and the detail when viewed through a loupe on the light table was absolutely stunning. I can still remember waiting a couple of days for the film to return from the lab, anxious to see if I had actually managed anything worthwhile. I would always bracket for exposure, so a roll of Velvia with 36 exposures actually meant only twelve distinct compositions. Quite often I would shoot just one roll of film in an entire morning, and even today when shooting digitally and relatively free from the capacity limits of slide film, I consider myself somewhat discerning about how often I press the shutter. Rather than click just because I can, I prefer to take my time in any given locale, really exploring the landscape in an attempt to come away with maybe one good photograph that I feel good about. When shooting digitally today though, I can pretty much tell right away if I am on the right track, and if not, I can make adjustments to both composition and exposure on the fly. The LCD on my digital camera allows me to review an image instantly, allowing for tweaks to be made to compositions, and the histogram gives me all the information I need to know about whether or not I have made an accurate exposure. This is all good, and it is one of the biggest reasons why we can improve our photography skills much faster than if we were still shooting film and waiting several days for feedback. You would think that the days of needing to be thrifty with exposures are gone, since the capacity of an 8GB compact flash card far outweighs the limits of a roll of film – but – there is a lot to be said for being frugal with the the number of clicks we make, taking the time to really “see” a composition… waiting for the right conditions… visioning a particular moment… before pressing that shutter button. Digital makes it easy to take a lot of photographs, but it doesn’t mean they are going to be good photographs. Here was me thinking I was quite discerning, making fewer exposures than the average digital photographer… but then I ran into Ben Horne, the prince of patience. When I say I ran into Ben, I mean that in a virtual sense. I first “met” Ben on the landscape board of the Fred Miranda web site where he always contributes great information and offers insightful and helpful critiques. Based in San Diego, Ben documents his travels to places like Zion National Park and the Colorado Plateau through his excellent blog, and like many photographers, he is generous in his willingness to share details of his vision, ideas and techniques. Ben is a different kind of cat though… he doesn’t shoot digitally, he shoots on film… big film. While I like to reminisce how nice a 35mm slide looked, I cannot imagine how impressive a medium format – or an 8×10 – transparency looks! Ben’s work is spectacular, and I always get inspiration from the process he employs on his extended trips for photography. Usually traveling solo, he details his experiences of searching for what is often a pre-conceived vision, and his behind the scenes videos of his adventures are especially interesting. The more restrained methodology and approach of a large-format landscape photographer – especially one as good as Ben – is quite something to behold, and I highly recommend checking out his work. Ben will spend days (and many return trips) familiarizing himself with a location, trying to understand the intricacies of the landscape and how the light interacts with it at different times of the day and in different conditions. If everything lines up the way he wants it to, he will press the shutter perhaps once that day… that’s right, once! He just returned from a 10 day trip to one of my favorite places – Death Valley National Park – and from Day One I thoroughly enjoyed vicariously coming along for the ride with him as he shared his stories of what seems like an awesome trip. 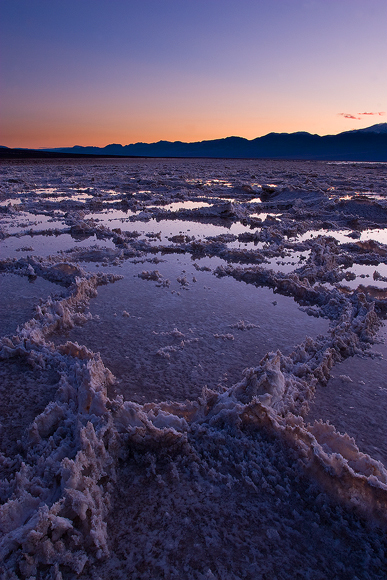 The photographs in this post are from my visit to Death Valley in February 2010 when the salt flats at Badwater were just starting to become flooded. The conditions on my trip were similar to what Ben experienced this year too, and it is always cool to see an iconic location like this in unusual circumstances. While Ben’s remarkable photographs certainly inspire me to get out with my own camera, I think what I admire most about his work is the patient and demanding approach he takes toward attempting to capture the beauty of nature. He is extremely passionate about his photography and he is constantly learning his craft… good lessons for us all. On the one hand leaving home a day early to avoid the bad weather on the east coast was incredibly exhausting as we crisscrossed the country over a two day period going from Bangor to New York to Indianapolis to Charlotte to Las Vegas… but on the other hand we earned ourselves a bonus afternoon and evening in Death Valley. As we neared our destination, it quickly became obvious that the park had not yet recovered from the winter storms that ravaged the area a few weeks back. There was standing water in many places along the roadside, with mud and debris often strewn across the blacktop. When we reached the valley floor, we were greeted with some warm sunshine and high clouds which was a nice change from the weather we would have been experiencing back in Maine. We were happy to be here enjoying the relatively warm temperatures, and we both marveled at the vastness of the landscape before us. After scouting a less-traveled trail just to the right of Zabriskie Point for another morning, our first task was to choose a location for our bonus evening of shooting. We both agreed that seeing the unique and surreal salt flats at Badwater would be a great way to start our adventure. 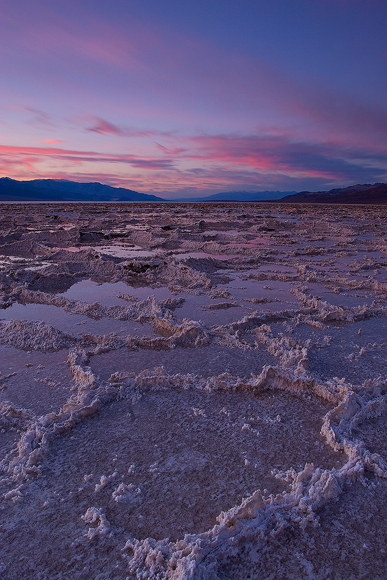 At 282 feet below sea level, these salt flats are an amazing sight. Blistering temperatures throughout much of the year usually mean that this landscape is parched of all water, leaving behind incredibly interesting polygon shaped ridges of salt scattered over a very wide area. As we ventured out onto the flats this evening though, we realized we were seeing this place in an even more unique state, with pools of water covering much of the valley floor. Sam and I both set out to explore the area, looking for pleasing compositions that might capture the grandeur of where we were. It was VERY cool to see him working with a tripod for the first time, and he totally embraced the process of trying to represent the beauty that we were seeing with his camera. It was funny though to see him pack up his camera right after the sun went down only to be completely surprised and delighted by the spectacular light that arrived about 10 minutes later. He hurriedly set everything back up again and was able to take advantage of the late magical light show we were blessed with, learning a very valuable lesson about the fleeting nature of good light. All evening he worked the scene like a pro, and I was a very proud father seeing him get so excited about something I too love to do. He truly does have a wonderful sense of how to compose an image, and I will share some of his photographs here in the next few days. I am hoping that he will write about his experiences too. OK… am officially a little worried about the impact the recent weather in Death Valley might have on being able to access some of the more remote parts of the park. After the last round of winter storms washed through DV, there apparently is still a lot of mud and debris around, especially on the dirt and washboard roads to places like the Racetrack, the Devil’s Golf Course, and Titus Canyon. With more showers possible in the next few days, things aren’t looking good for being able to get to some of the more isolated locations in the park. On the plus side though, atypical weather conditions might make for some interesting photographic opportunities in the desert. Even though the road to the Racetrack is open, the playa is still wet, and NO-ONE SHOULD EVER WALK ON THE PLAYA WHEN IT IS WET – footprints left there can last for years, so with that in mind it unfortunately looks like we will not make it there on this trip. Over the next few days we will be examining our options… maybe we see the iconic sights of DV and then wander on over to CA 395 and explore that region for a couple of days? Last year I had a chance to briefly visit the Alabama Hills behind Lone Pine, and found it to be an incredibly beautiful landscape. At 14,505 ft, Mount Whitney and the Eastern Sierra tower over a desert-type landscape that flows over huge rounded rocks and down into the Owen’s Valley – a landscape that definitely lends itself to photography. I have always wanted to explore from Lone Pine up through Bishop and on to Mono Lake, and this might be a great time to do that. Not being completely familiar with the area, I have been using Internet social networking tools like Flickr and photography forums to reach out to others with experience from these regions for advice on shooting locations and weather conditions. It never ceases to amaze me how generous people are with sharing information and ideas. Photographers like Ben Horne, Dan Mitchell, Kevin McNeal, Phil Kuglin, Jim Fox have all been incredibly generous with their knowledge and expertise, so thank you to everyone who has helped. 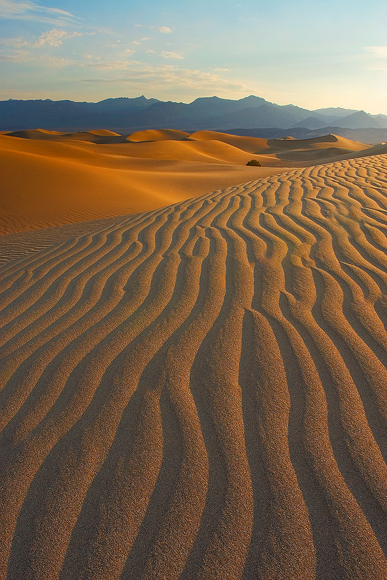 The image in this post was made on a previous visit to Death Valley, and is from the dunes near Stovepipe Wells. This is a morning shot, and I loved the patterns and textures that were accentuated by the early light. I was lucky on this occasion that there weren’t too many footprints to deal with – a sandstorm had come whipping through the previous afternoon erasing all evidence of human presence. Am very much looking forward to getting back here, this time with Sam. There are just over two weeks until Sam and I take what I am sure will be a trip of a lifetime. 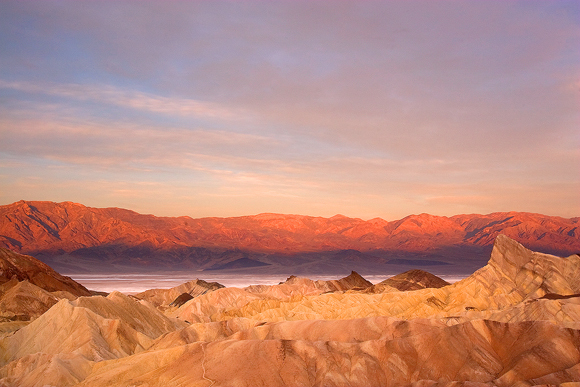 We leave for Death Valley, California on February 10th, and we are starting to get serious about our preparations. One of the things we are paying special attention to is the weather. Lately the west coast seems to be getting hit with storm after storm, and some of the moisture has even reached into the central valley and beyond. Floris van Breugel just posted an amazing photograph and interesting narrative from a recent trip to DV where he witnessed rarely seen reflections from rainwater on the Badwater salt flats – read the post on his blog. 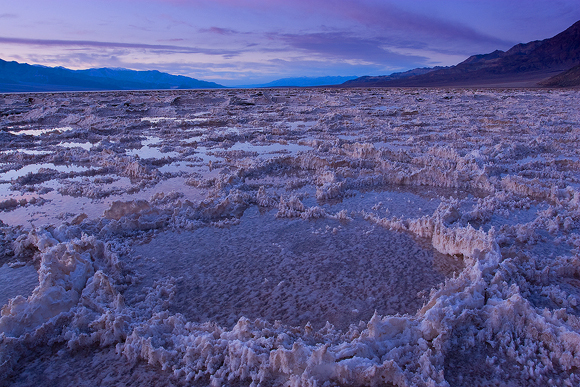 Normally Death Valley gets very little rainfall, but when it does, it can create havoc with flooding and moving of the earth. When I check the road conditions – a key to being able to truly explore the park – it is obvious that the area is struggling to deal with the impact of the recent storms. When we get a little closer to our departure date we will be paying even more attention to the link to road conditions. Fingers crossed that things open up again by then, but we are developing a Plan B just in case. Temperatures have been at or below average for a while now, and within a week or so we will be able to check the 10-day forecast for the region to get an idea of what kind of weather we have in store for us. Obviously we are hoping that things get back to “normal” before then, and that the temperatures are more like expected for this time of year – the low to mid-seventies would be nice. High on our list of places to see is The Racetrack, a dried up lake bed tucked away in an extremely remote and desolate part of the park that is home to the legendary “moving rocks” on the playa. Our plan is to spend the night out there so that we can really explore the area and capture the light at dusk, at night, and in the morning. Looking at the lunar schedule, we will have no moon to deal with, so our plan to also attempt to create some star trail photographs from this unique and special place looks like a go – as long as we don’t get clouds! 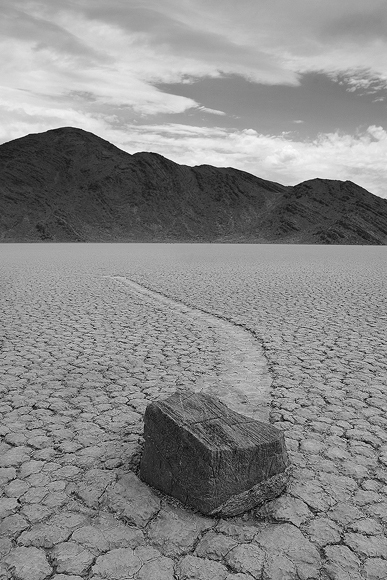 From my last trip to The Racetrack… here’s an image showing one of the moving rocks that this place is renowned for. I remember the overwhelming feelings of isolation and awe that being at The Racetrack brought, and I am very excited to be able to share what I know will be a powerful experience with Sam.